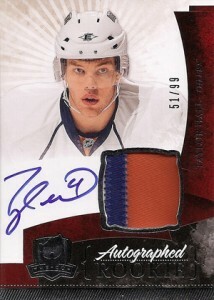 When Upper Deck launched The Cup in 2005-06, it was hockey's answer to the company's Exquisite line. Everything about the brand was intended to be the example of what an ultra high-end line could be. They also set the bar for hockey's rookie cards. While the Upper Deck Young Guns may be the most collected, The Cup is where a lot of collectors look for the most valuable rookie cards. Between 2005-06 and 2010-11, no rookies have been numbered higher than 249. The best players usually have just 99 copies. But low numbering isn't enough to make a classic rookie. The Cup also includes on-card autographs. Usually, they memorabilia swatches also with multi-colored swatches. While the high prices of these cards may limit a lot of collectors, when a player gets hot, these are the cards the get a lot of attention. It can be a risk, but that's part of the fun of collecting high-end cards. 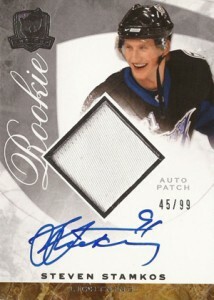 Here's a list of the best Upper Deck The Cup rookie cards released between its debut year of 2005-06 and 2010-11. 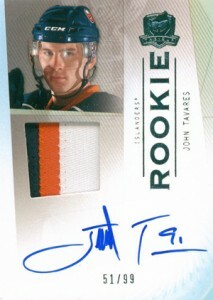 Although not as hot as he once was in the hobby, John Tavares is still very young. His points totals increased in each of his first three seasons in the league including 31 goals in 2011-12. When Tavares find himself on a winning team, the spotlight should shine on the young center once again. This could send his cards back to the heights they once enjoyed. 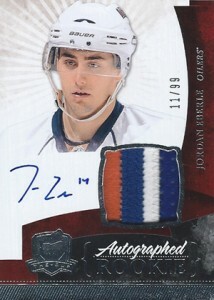 Jordan Eberle is one the core pieces of the Oilers that should pose as a serious threat in the very near future. His stock is rising quickly, especially after being somewhat overshadowed in his rookie season by teammate Taylor Hall. 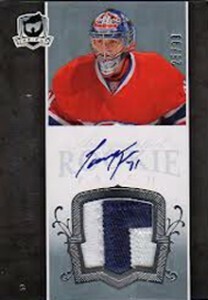 Carey Price is one of the game's great goalies on one of the league's most storied franchises. Those two factors alone make him one of the most popular players in the hobby. 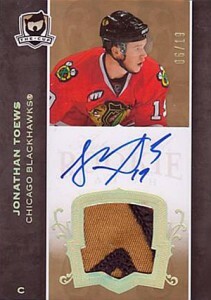 Factor in the potency of The Cup's brand recognition and you've got one of the decade's best rookie cards. Another piece of the puzzle that's trying to make Edmonton the "City of Champions" once again, Taylor Hall's flashy play has captured the attention of collectors outside the Prairies as well. Although he's cooled a little since his rookie season, once the Oilers start winning, this card could shoot right back up. Tyler Seguin began his career as a big-time prospect, but not one who made an immediate splash -- at least during the regular season. After being a scratch during the first half of the 2011 playoffs, Seguin got his opportunity to play. He didn't disappoint, notching six points in his first two postseason games and helped the Bruins to the Stanley Cup. In 2011-12, Seguin led the Bruins with 29 goals. If there's one thing Jonathan Toews is known for, it's winning. The Blackhawks captain help lead the team to the Stanley Cup in 2010, winning the Conn Smythe Award as the playoff MVP in the process. He also won two World Junior Championships and a Gold Medal at the 2010 Winter Olympics in Vancouver. Evgeni Malkin is one of hockey's elite players who has a knack for collecting hardware. After winning the Calder Trophy as the NHL's top rookie, he helped Pittsburgh capture the Stanley Cup in his second season. He was named the Conn Smythe winner. 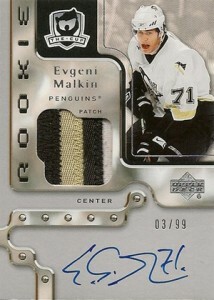 After being a finalist for the Hart Trophy as the NHL's MVP twice, Malkin finally won the award in 2011-12. Steven Stamkos has emerged as one of the most gifted goal scorers of his generation. Picked first overall in the 2008 NHL Draft, he stuck with the Lightning right out of training camp. By the age of 22, Stamkos had already won the Maurice Richard Trophy for the league's leading goal scorer twice. Alexander Ovechkin is one of the league's most high-profile players. A flashy goal-scorer, he is also one of hockey's greatest showmen. While this turns off some collectors, it's just the kind of savvy that others love. The one universal knock against Ovechkin is that he and the Washington Capitals have been postseason underachievers in recent years. If the Russian is able to bring a Stanley Cup to D.C., Ovechkin could overtake his greatest rival -- Sidney Crosby. Sidney Crosby is the face of the NHL. He entered the league in 2005-06 as one of the most highly touted rookies in the history of the game. Under the mentorship of Mario Lemieux, Crosby hasn't disappointed. He helped bring the Stanley Cup back to Pittsburgh in 2009. In 2010, he scored a dramatic gold medal-clinching overtime goal for Canada at the Olympics in Vancouver. This is a moment that will live on forever in Canadian hockey history. Concussions limited Crosby to just 63 games total in 2010-11 and 2011-12. However, Crosby, the NHL and collectors all remain optimistic about his return. 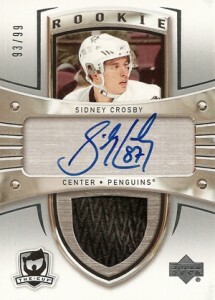 The 2005-06 The Cup Sidney Crosby is the definitive hockey card of the modern hits-driven era, selling for several thousand dollars on the rare occasions that it does show up.